But, do we all use our computers in the knowledge that we’re safe from hackers, viruses and other harmful devices/people? If you just answered yes to that question, then think again. Only a few of us actually make the effort to ensure our safety online and there’s a whole lot more of us that use no internet security at all and leave our information scribbled over the internet; making it easy for hackers and other people to access our personal information and impersonate us. So, as today is Computer Security Day 2012 here are some things you should take in to account when you use a computer, and the internet, next. When using social media sites (Facebook, Twitter) or personal accounts (e.g. online stores such as Asos, Play, Amazon, Topshop etc), always use passwords that will be hard for people to guess. That way, you increase your personal safety. It’s advised that you use a mixture of capital letters and at least three numbers for your password/s, and never use the same password for different sites. Always change your social media account settings to private. That way, only people you know or choose to add as online friends can have access to your personal social media accounts and heavily reduces the chances of your personal data being stolen. 90% of social media sites set your privacy setting to open by default, so be aware of this and change your account to private in your account or privacy settings. Never post bank details on social media sites, online forums or chat rooms. Anyone can access these sites and some people trawl through the internet searching for personal bank details. This is a sure-fire way to get your personal details stolen, your money stolen and for your online identity to be stolen. Never post personal information on social media sites, online forums or chat rooms. Personal information can be: your address, your telephone number, your bank details, passwords etc. Never trust strangers or give them your personal details. Also, never go on webcam with a stranger or send photos of yourself, or friends, to people you don’t know because it’s easy to print screen an image on the screen and your image could then be seen by anybody in the world. Check the security and safety of your computer hardware, such as using passwords to prevent other people logging in to your personal computer account. Check for software and program vulnerabilities and that all your software and anti-virus programs are up-to-date and working. If you haven’t changed your password for a while, do it today. Do a virus sweep. If you find a virus, here’s how to remove one. Delete unused or unneeded files as they can use up memory. Get rid of cookies, especially Adobe Flash-related ones. Here’s how to delete them. Back up your computer data by using USB sticks, hard drives or sites such as Dropbox. It’s easy to lose important information so always make sure you back up important files. You should do this regularly, and to be extra safe you should back up your files and information every time you use your computer. Never leave a computer you’re using unattended in a public place. This makes it really easy for others to steal your personal data. Never leave your laptop in open sight of other people. Always keep it out of sight, or take it with you and remember to take your USB stick or hard drive with you, too, when leaving a public place. You should also avoid carrying laptops in busy places where mugging and pickpocketing is known to happen and always have your wits about you. When donating an old computer to charity, schools, or a recycling depot, always ensure the computer is wiped clean of everything. It’s simple for anybody to access your personal information otherwise. 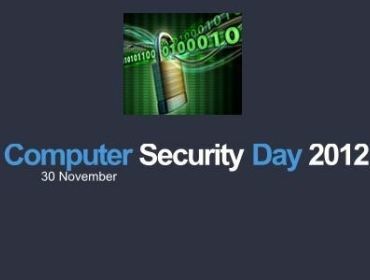 Keep safe on Computer Security Day 2012 and use these tips to ensure your safety offline and online.